The Windows Live Mail team just got a philosophy. Companies that have pro-participant philosophies, especially in the advertising age, will end up with bigger audiences and more profit in the end. Pro-participant? Really? 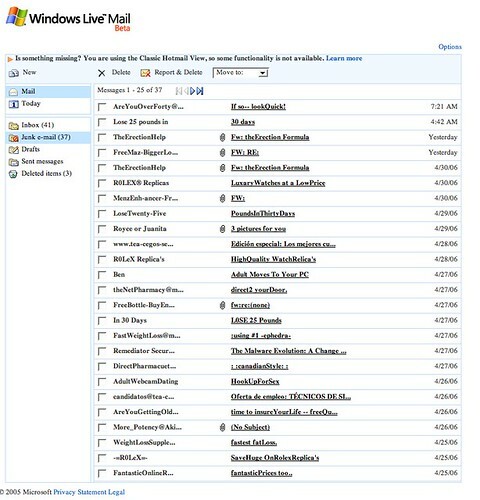 Then why is the Windows Live Mail interface crap on anything other than Internet Explorer? This strikes me as a completely exclusionary philosophy – an anti-participant one if you will. You can use our mail application (to make us money by serving you ads) only on the (completely insecure) browser we make. Most bloggers and journalists use a Mac and/or Firefox and this audience was just completely alienated from Live Shopping. Same goes for Windows Live Mail guys – c’mon, get a clue. This is 2006, not 1996. If you are releasing sites these days, they have to run on more than Internet Explorer. That war is over guys, and you lost. Why doesn't PodZinger provide transcriptions back to the podcasters? It’s a totally uncool thing to do and buys them no respect from those in the know. But if their aim is to increase (or promote) the use of IE, is it a stupid thing to do? Microsoft is an authoritative body in the eyes of most people. A lot of folks will buy being told by MS that IE is best and that that’s why they need it for their Live software. It implies “other browsers aren’t good enough to handle our sophisticated technology”. If you think the war is over and Microsoft lost, you don’t know much about fighting or Microsoft…. While I (and many others internally) 100% agree beta sites should come out with full Firefox/Opera/Safari support, Mail and Shopping are still in initial beta and the teams are working up full browser compatibility for launch as we type. It’s not some battle tactic to promote IE. @Eoghan – the issue I have is that their aim should be to promote the use of Windows Live Mail or Windows Live Shopping respectively – NOT Internet Explorer! In fact, this ploy does the opposite and ensures many non-IE users will not alone not use it – they will post posts like this one, denouncing the products. @ Stewart – possibly you haven’t read John Dvorak’s article on Internet Explorer. Have a read off that and then tell me Microsoft haven’t lost. @ Kevin – Live has been working on browser (and platform) compatibility since its predecessor Start.com was launched. I have posted several times on this blog about that. Either it is taking an incredibly long time, or it is very far down Microsoft’s priority list which is another way of saying IE or nothing (until we get around to non-IE browsers). That’s actually a lot better then what it used to be like.